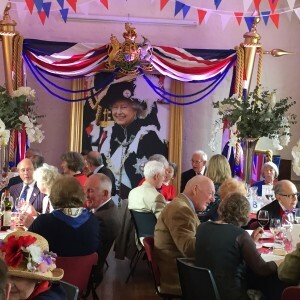 Sam and Kate Wass arranged a magnificent lunch and afternoon in Chipping Campden Church Rooms to celebrate and pay tribute to Her Majesty Queen Elizabeth II on her 90th Birthday. The decoration of the Church Rooms were designed and installed by Gary Withers, and the food was cooked and served by Toke’s, in Campden High Street. Sam asked everyone to pay £25.00 towards the cost of the occasion and then very generously announced that this money would in fact be donated to Campden Home Nursing – a grand total of £2000. We are so thankful for his support and generosity.